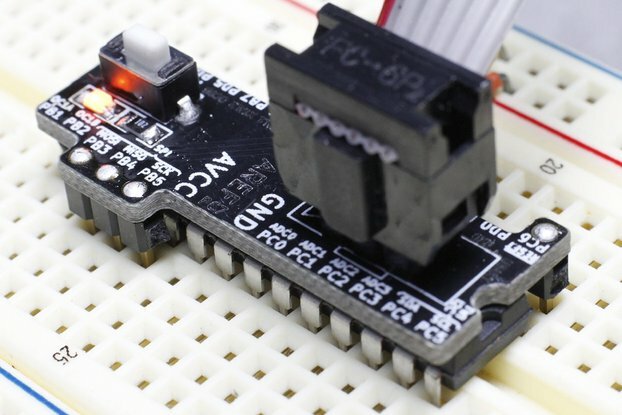 Breadboard ISP programming done easy! So I bought this "kit" for $5.00 + $1.50 to ship. In three short days, it arrives and I open it, expecting my bag of parts and a board. Just looking at the packaging I realized that there had been so much thought given to my $5 investment that I had to do a review to say thank you. One of the problems with buying online is shipping. Notice how the shipping was only $1.50? I did. When the kit arrived, it was evident. It was just a small, flat, unpadded envelope shipped just regular old First Class mail at two ounces. Inside was the answer to the shipping. The parts were nested in a laser cut foam core board that allowed the envelope to go through the USPS machines without damage. First wow. Unpacking the parts was as simple as peeling the tape off one side of the foam core. Now I'm looking at the parts and I'm confused. So now I guess I have to look at the documentation. I hadn't done this since I thought if I needed help on how to put this together, I'm in the wrong hobby. Everything explained and more. Second wow. So it's all together and time to try it out. Of course it works. Even the orange LED. Third wow. Best $5 I ever spent online! Wow Randy, thank you for your glowing review. I'm glad to know the packaging method worked well and the unpacking, assembly, and use of this kit has been as easy as I tried to make it. Also, thank you for letting me know the assembly instructions are useful, even to a savvy hobbyist such as yourself. Nicely done, great attention to the details. First, let me say the laser cut package, out of recycled cardboard, had me smiling, I'll be reusing it. I opted for the fully soldered version and don't regret it. To get the extra bit of length out of standard headers, so they'll get a good contact with the breadboard, the people at Ossicons Labs pressed the insulator so that 'just enough' of the board side lead would be soldered. One of the side effects of this is the soldered side has a nice smooth braille bump, nothing poking out of the solder joint. Nice work.